I posted a share of my 7 Inch version of this record HERE. 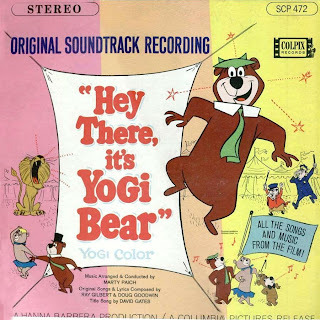 Doug Dale just shared with me his 12 Inch version of the LP that goes with this Yogi Bear movie. Thanks Doug!! I know that it has been awhile but is it possible to re-up this classic again. The link doesn't work anymore. I might one day, but not in any hurry to ren-new any of my links as they get deleted almost as soon as I do. Hi. Thought I try again and ask if you could please re-up this soundtrack again. MARX PAYSET, FIGURES, AND TOYS GROUP!!! PLEASE DO NOT HOTLINK TO MY SHARES. GIVING ME "CREDIT", AND USING MY LINKS IS STILL BANDWIDTH THEFT NO MATTER HOW YOU LOOK AT IT. THANKS! I have a large collection of LPs, Cassettes, and CDs, and now Reel To Reel Tapes. So I set up all of my blogs to share them with the world as about 90% of them are no longer available for sale. Enjoy!!! Mostly Ghostly Music Sharing Blaaahhhggg!! !